Background: Retinopathy is a common complication of diabetes mellitus that if detected early by regular retinal examinations can be treated; thus, blindness can be delayed or prevented. 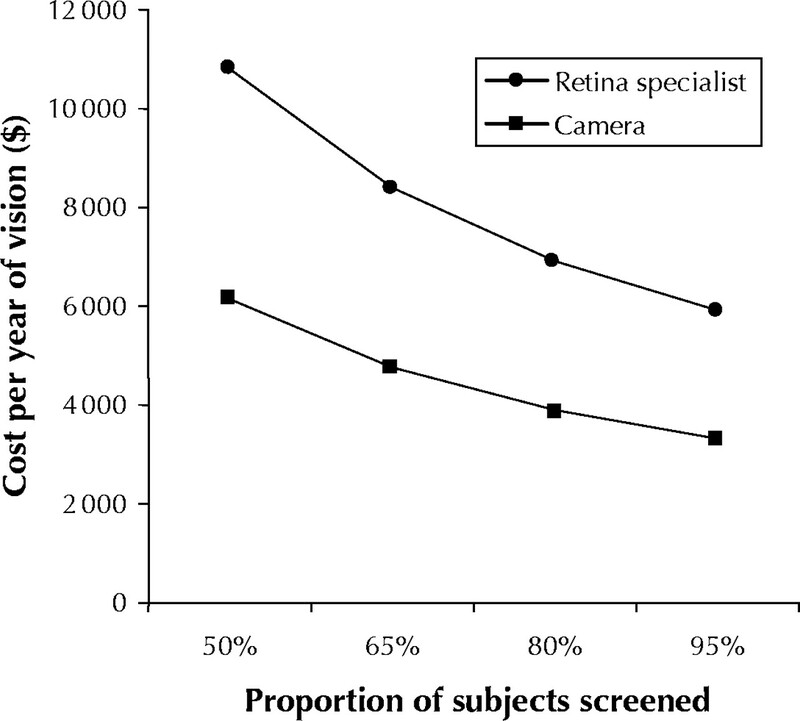 Providing high-quality retinal screening is difficult, especially in rural and remote areas. Canada's First Nations population has a higher prevalence of diabetes and is, in general, more geographically isolated than the broader Canadian population. We modelled the cost-effectiveness of retinopathy screening by travelling retina specialists versus retinal photography with a portable digital camera in an isolated First Nations cohort with diabetes. Methods: The 2 screening programs were modelled to run concurrently for 5 years, with outcomes evaluated over 10 years. To construct economic models for the population of Cree individuals living in the western James Bay area of northern Ontario, we used available data on the prevalence of diabetes in the area and estimates of the incidence of retinopathy derived from the published literature. We compared the screening models and calculated total costs, visual outcome, costs per sight-year saved and costs per quality-adjusted life year (QALY). We also estimated the costs of implementing a screening program for all First Nations individuals in Ontario with diabetes and no access to an ophthalmologist. Results: From the perspective of the health care system the camera program was preferable to the specialist-based program. Over 10 years, 67 v. 56 sight years were saved, compared with no screening, at costs of $3900 v. $9800 per sight year and $15 000 v. $37 000 per QALY. Generalizing these results to the province of Ontario, the camera system could allow most isolated First Nations people with diabetes to be screened for 5 years for approximately $1.2 million. Interpretation: A portable retinal camera is a cost-effective means of screening for diabetic retinopathy in isolated communities of at-risk individuals. Fig. 1: Typical image of nonproliferative diabetic retinopathy with clinically significant macular edema (CSME). A photographic system has advantages over the specialist-based model. First, technicians can perform camera screening. Second, a camera can be flown to an isolated community. Third, images can be archived to permit comparison over time. The purpose of this study was to compare the cost-effectiveness of screening by means of a portable retinal camera with that of the existing screening program for the First Nations population of the James Bay area of northern Ontario, Canada. The reference program was the existing model of screening for diabetic retinopathy in western James Bay, wherein retina specialists visit Moose Factory every 6 months to examine people with diabetes. Patients in outlying communities are flown to Moose Factory. Proposed for the alternative program was photographic screening with a digital camera capable of 50° photos of the retina, according to a validated protocol.26 Digital images are produced instantaneously, allowing immediate assessment of quality. They can also be electronically transferred to a remote reading centre. Because of the camera's ease of use, pupil dilation is not usually needed. However, dilation is often required to improve image quality in the Cree population27 and was taken into consideration in this analysis. The 2 programs were modelled to run concurrently for 5 years. From the average age of the cohort (50 years) and a conservative life expectancy of another 10 years, we chose 10 years as the interval over which the effect of the screening programs would be evaluated. We conducted the economic analysis from the health care system's perspective, using only costs directly related to implementing and running each program. Sources of financial information included the Communications Office of Weeneebayko General Hospital and the Regional Health Planning Office, both in Moose Factory. We estimated costs of personnel, transportation and equipment from detailed evaluations of each program. Retina-specialist costs were based on the stipend currently paid by the Weeneebayko General Hospital. Technician costs were based on current prevailing wages. Transportation costs were those paid by the regional health board to the contracted air carrier and ground transport providers. Equipment costs were based on vendor quotations. All costs were calculated over a 5-year period, were discounted by 5%, are presented in 1998 Canadian dollars and are not inflation-adjusted. Information on the incidence of diabetes in the region was obtained from the Regional Diabetic Health Project of the Muskegowuk Tribal Council (personal communication, 1997). The effectiveness of each program was represented by sight years and quality-adjusted life years (QALYs), calculated from program-specific probability models of visual outcomes in the same cohort (650 individuals with diabetes) (Fig. 2) and discounted by 5% yearly. The cohort accumulated lost sight years as they passed through 5 one-year cycles within each program. At the end of the 5-year screening period, lost sight years were projected forward for another 5 years to account for ongoing vision savings. QALYs are a measure of the reduction in quality of life experienced by individuals with a disability relative to normal health. For individuals with diabetes a QALY has been estimated at 0.85.32 This can be compared with the relative utility of severe vision loss due to diabetic retinopathy, which has been estimated at 0.59 QALYs, a figure in keeping with those for other diabetes-related complications.33 QALYs were calculated for each program from the proportion of individuals expected to lose vision and were considered alone and in relation to the program cost. Individuals who did not have retinopathy that required treatment and those who were missed by the screening process in year 1 re-entered the probability model in year 2 and so forth. Individuals who required treatment were removed from the cohort annually; thus, the number of individuals screened in subsequent years decreased. Those losing vision continued to contribute lost sight years to the cohort for the 10-year period. Those who died were “replaced” yearly by individuals with new diagnoses of diabetes. Cost-effectiveness ratios were generated by dividing program costs by the years of sight saved by each program. Within the present screening program 55% of individuals with diabetes in the region are screened yearly (65% of those in Moose Factory and Moosonee; 45% of those in the outlying communities, which have a combined population similar to that of Moose Factory and Moosonee together. )27 For the camera program, 80% of individuals with diabetes in the region were presumed to have been screened — a higher figure than for the retina specialist because of the greater availability of the camera. Maximizing the percentage of individuals evaluated is important to any screening program. For this reason, we performed a sensitivity analysis to uncover differences between the programs for a range of possible screening percentages: 50%, 65%, 80% and 95% (Figs. 3 and 4). 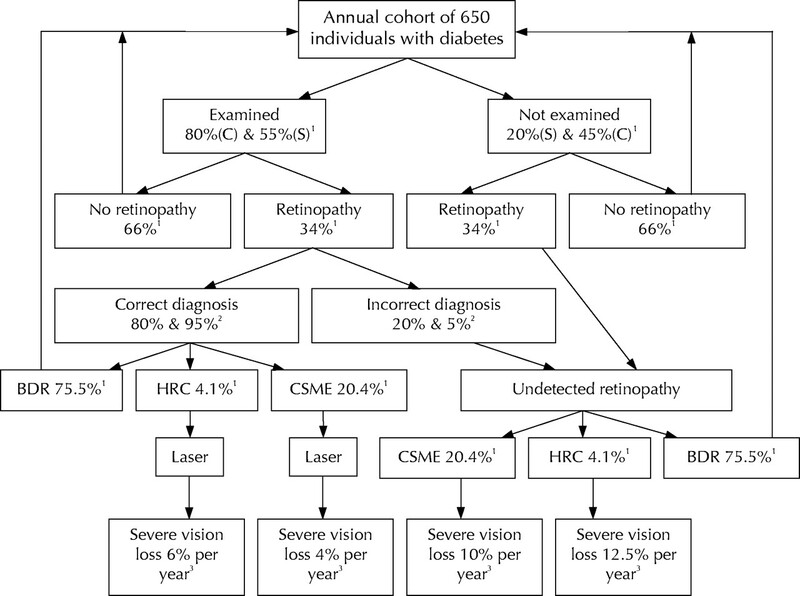 Diabetic retinopathy in the cohort was expected to progress in a bilateral, symmetric manner over the course of each year, so that there would be more advanced disease in the cohort at the end of the year. We assumed that all patients requiring treatment underwent treatment. We performed Monte Carlo modelling to generate probability distributions for all major outcomes. Using Crystal Ball 2000 software (Denver, Colorado) employing a Bayesian approach with random sampling for 10 000 iterations, we simultaneously evaluated the following variables with known uncertainty in effectiveness models: estimates of diabetes prevalence, screening sensitivity of retina specialists and retinal cameras, retinopathy prevalence and number of subjects screened. To estimate the 5-year costs of screening all Ontario First Nations individuals with diabetes and no access to an ophthalmologist, we first determined the 5-year cost of screening a single such individual. We assumed that the estimated costs for western James Bay would apply to other remote regions of the province. We then compared Statistics Canada census data with the Canadian Ophthalmological Society's physician roster and counted individuals of Status First Nations residing in census metropolitan areas (CMAs) or remote, non-CMA areas that did not have access to an ophthalmologist. Finally, assuming a crude diabetes prevalence of 6%, we calculated the number of such individuals with diabetes. In both programs severe vision loss developed in 0.5% to 0.6% of all individuals; the rate was 0.9% in the absence of a screening program. The camera program was the more cost-effective, maintaining the highest number of sight years and being cheaper than the specialist-based program (Table 1). The camera program also had the best cost-per-QALY ratio (Table 1), at $15 000, within the range for medical programs that are strongly recommended (less than $20 000/QALY).34 The sensitivity analysis using screening percentages of 50%, 65%, 80% and 95% demonstrated that this program would meet the threshold of $20 000 per QALY if 65% or more of the population with diabetes were screened yearly (Fig. 3). Similarly, the camera program would cost less than $5000 per year of vision saved if 65% or more of the population was screened (Fig. 4). Fig. 4: Cost per year of vision saved when various proportions of individuals with diabetes were screened in the 2 programs. Fig. 3: Cost per quality-adjusted life year (QALY) when various proportions of individuals with diabetes were screened in the 2 programs. Were a general ophthalmologist to perform the screening in place of a retina specialist, the existing program would save only 47 sight years and 12 QALYs compared with no program, at higher costs: $11 700 per sight year and $45 000 per QALY. The Monte Carlo simulations — evaluating uncertainty associated with the effectiveness models — generated distributions for all primary outcomes (Figs. 5 and 6, available at www.cmaj.ca). These probability histograms, which compared outcome measures for the 2 programs, demonstrated that variability inherent to parameters within the effectiveness models did not affect the results of this study. A camera program providing 5 years of screening for diabetic retinopathy in all isolated First Nations communities in Ontario would cost approximately $1.2 million. The camera program had the lowest cost. By 5 years, the acquisition cost had become an insignificant contributor to overall program expenditures. Savings were realized through lower personnel and transportation costs. Both screening programs realized sight savings. Roughly twice the number of individuals lost vision yearly in the absence of a retinopathy screening program. Sensitivity analyses did not change the overall results. The camera system would be highly successful even with screening percentages as low as 65%. The health care system perspective that we used did not include social benefit payments for patients who had permanent visual disability.35 None the less, disability was somewhat represented by sight years lost in the denominator of the cost-effectiveness ratio and was lowest for the camera program. The estimated costs for screening all Status First Nations people in Ontario are likely low, because individuals from the 34 reserves that refused to be enumerated during the 1996 census were not included. Nevertheless, the camera system would be more cost-effective. Despite the potential benefits, a camera allows only screening for diabetic retinopathy and other central retinal disorders. Problems arise if patients or health care administrators assume that a photographic retinal evaluation is equivalent to a complete ocular assessment. Glaucoma, anterior segment disease and cataracts will be noted only in the specialist-based program; however, the constraints of screening large numbers of people in a short time make this program inappropriate for the provision of complete eye care. For this reason, general eye care services must be made available in isolated regions, regardless of the additional benefits of diabetic retinopathy screening programs. In conclusion, this study suggests that a portable retinal camera is a more cost-effective means of screening for diabetic retinopathy than a retina specialist in isolated First Nations communities. Contributors: Drs. Maberley and Cruess were jointly responsible for project conception and data collection. Dr. Maberley was also responsible for protocol development, statistical and economic analysis, writing and revision. Dr. Walker drafted reviews and contributed to protocol development and economic analysis. Dr. Koushik contributed to statistical modelling and analysis, epidemiologic methodology, census-data work and data collection. Dr. Cruess also drafted reviews. All authors approved the final version of the manuscript. Wisconsin Epidemiologic Study of Diabetic Retinopathy. III. Prevalence and risk of diabetic retinopathy when age at diagnosis is 30 or more years. Arch Ophthalmol 1984;102:527-32. Maberley D, King W, Cruess A. Prevalence of diabetes in the Cree of Western James Bay. Chronic Dis Can 2000;21:128-33. Evers S, McCracken E, Antone I, Deagle G. The prevalence of diabetes in Indians and Caucasians living in Southwestern Ontario. Can J Public Health 1987; 78:240-3. Delisle HF, Ekoé JM. Prevalence of non-insulin-dependent diabetes mellitus and impaired glucose tolerance in two Algonquin communities in Quebec. CMAJ 1993;148:41-7. Montour LT, Macaulay AC. High prevalence rates of diabetes mellitus and hypertension on a North American Indian reservation. CMAJ 1985;132:1110-2. Harris SB, Gittelsohn J, Hanley A, Barnie A, Wolever TM, Gao J, et al. The prevalence of NIDDM and associated risk factors in native Canadians. Diabetes Care 1997;20:185-7. Diabetic Retinopathy Study Research Group. Photocoagulation treatment of proliferative diabetic retinopathy. Clinical application of Diabetic Retinopathy Study (DRS) findings, DRS report number 8. Ophthalmology 1981;88:583-600. Early Treatment Diabetic Retinopathy Study research group. Photocoagulation for diabetic macular edema. Early Treatment Diabetic Retinopathy Study report number 1. Arch Ophthalmol 1985;103:1796-806. Singer D, Nathan D, Fogel H, Schachat A. Screening for diabetic retinopathy. Ann Intern Med 1992;116:660-71. Javitt J, Canner J, Sommer A. Cost effectiveness of current approaches to the control of retinopathy in type 1 diabetics. Ophthalmology 1989;96:255-64. Javitt J, Aiello L. Cost-effectiveness of detecting and treating diabetic retinopathy. Ann Intern Med 1996;124:164-9. American College of Physicians, American Diabetes Association, American Academy of Ophthalmology. Screening guidelines for diabetic retinopathy. Clinical guideline. Ann Intern Med 1992;116:683-5. Expert Committee of the Canadian Diabetic Advisory Board. Clinical practice guidelines for treatment of diabetes mellitus. CMAJ 1992;147:697-712. American Diabetes Association. Position statement. Diabetes Care 1998; 21(Suppl 1):S47-49. Meltzer S, Leiter L, Daneman D, Gerstein HC, Lau D, Ludwig S, et al. 1998 clinical practice guidelines for the management of diabetes in Canada. Canadian Diabetes Association. CMAJ 1998;159(Suppl 8):S1-S29. Brecher R, Cowie C, Howie L, Herman W, Well J, Harris M. Ophthalmic examination among adults with diagnosed diabetes mellitus. JAMA 1993; 279: 1714-8. Klein R, Klein BEK, Moss SE, Davis MD, DeMets DL. The Wisconsin epidemiologic study of diabetic retinopathy. VI. Retinal photocoagulation. Ophthalmology 1987;94:747-53. Kosousek V, Brown M, Cottle R, Hicks V, Langille D, Dingle J. Use of ophthalmologic services by diabetic patients in Nova Scotia. Can J Ophthalmol 1993; 28:7-10. Hammond CJ, Shackleton J, Flanagan DW, Herrtage J, Wade J. Comparison between an ophthalmic optician and an ophthalmologist in screening for diabetic retinopathy. Eye 1996;10(Pt 1):107-12. Kleinstein RN, Roseman JM, Herman WH, Holcombe J, Louv WC. Detection of diabetic retinopathy by optometrists. J Am Optom Assoc 1987;58:879-82. Sussman EJ, Tsiaris WG, Soper KA. Diagnosis of diabetic eye disease. JAMA 1982;247:3231-4.
de Sonnaville JJ, van der Feltz, van der Sloot D, Ernst L, Wijkel D, Heine RJ. 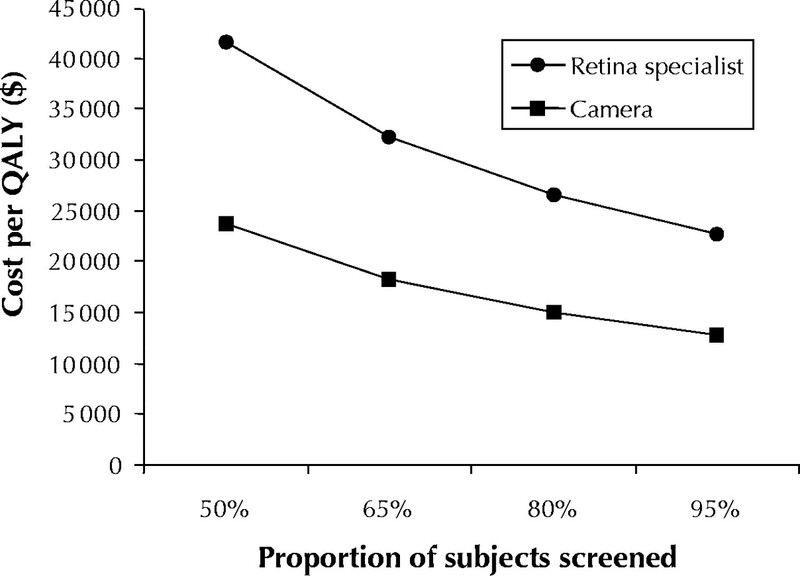 Retinopathy screening in type 2 diabetes: reliability of wide angle fundus photography. Diabet Med 1996;13:482-6. Williams R, Nussey S, Humphry R, Thompson G. Assessment of non-mydriatic fundus photography in detection of diabetic retinopathy. BMJ 1986;293:1140-2. Joannou J, Kalk WJ, Mahomed I, Ntsepo S, Berzin M, Joffe BI, et al. Screening for diabetic retinopathy in South Africa with 60 degree retinal color photography. J Intern Med 1996;239:43-7. Brassard P, Robinson E, Lavalle C. Prevalence of diabetes mellitus in the James Bay Cree of northern Quebec. CMAJ 1993;149:303-7. Klein R, Klein BE, Neider NW, Hubbard LD, Meuer SM, Brothers RJ. Diabetic retinopathy as detected using ophthalmoscopy, a non-mydriatic camera and a standard fundus camera. Ophthalmology 1985;92:485-91. Maberley D, Barile G, Cruess A, Slakter J. Digital photographic screening for diabetic retinopathy in the James Bay Cree. Ophthalmic Epidemiol 2002;9:169-78. Liesenfeld B, Kohner E, Piehlmeier W, Kluthe S, Addington S, et al. 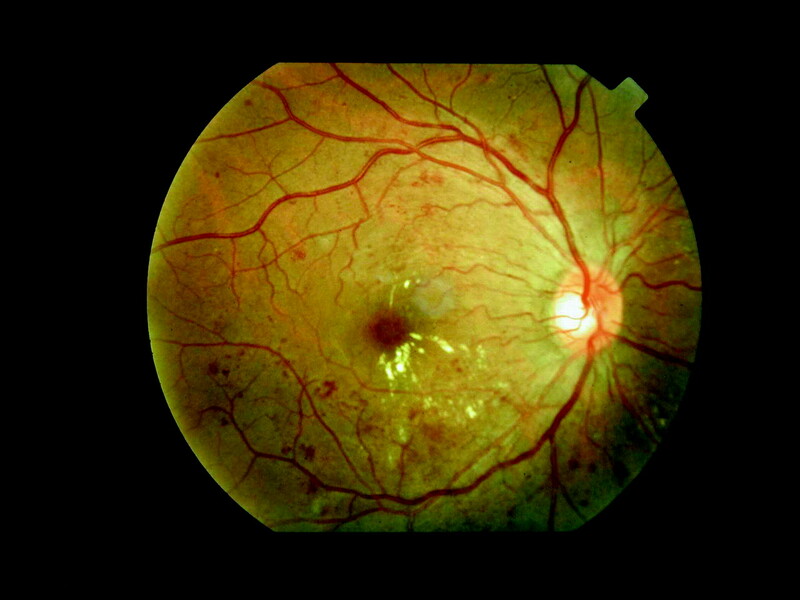 A telemedical approach to the screening of diabetic retinopathy: digital fundus photography. Diabetes Care 2000;23:345-8. Moss SE, Klein R, Kessler SD, Richie KA. Comparison between ophthalmoscopy and fundus photography in determining severity of diabetic retinopathy. Ophthalmology 1985;92:62-7. Kinyoun J, Barton F, Fisher M, Hubbard L, Aiello L, Ferris F. Detection of diabetic macular edema. Ophthalmoscopy versus photography — Early Treatment Diabetic Retinopathy Study report number 5. The ETDRS Study Group. Ophthalmology 1989;96:746-51. Schachat AP, Hyman L, Leske MC, Connell AMS, Hiner C, Javornik N, et al. Comparison of diabetic retinopathy detection by clinical examinations and photographic gradings. Arch Ophthalmol 1993;111:1064-70. Brown MM, Brown GC, Sharma S, Shaw G. Utility values and diabetic retinopathy. Am J Ophthalmol 1999;128:324-30. Mittmann N, Trakas K, Risebrough N, Liu BA. Utility scores for chronic conditions in a community-dwelling population. Pharmacoeconomics 1999;15:369-76. Gold MR, Siegel JE, Russell LB, Weinstein MC. Cost-effectiveness in health and medicine. Oxford: Oxford University Press; 1996.